By Melissa Lennig on November 30, 2017 21 Comments. This content contains affiliate links. As an Amazon Associate I earn from qualifying purchases. Are you looking for an easy decorated Christmas cookie recipe to make with your kids? Look no further! 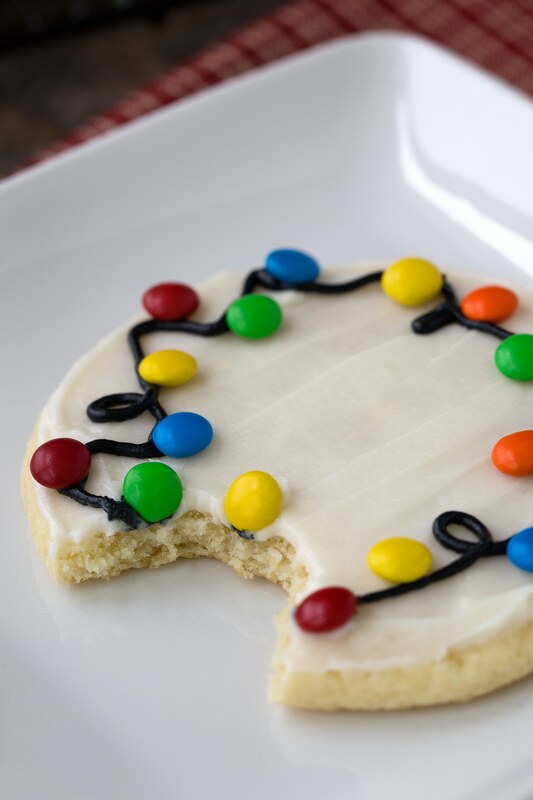 These homemade Christmas Lights Cookies are the best! They are fun to bring to cookie exchanges, so bake and freeze extra cookies to share with friends and family. Every holiday season, I decorate soft sour cream cookies for my kids. This Christmas, I pulled inspiration from these adorable Christmas Lights Cupcakes. My excited boys “oohed” and “aahed” at the sight of the cookies and couldn’t wait to share them with Santa! 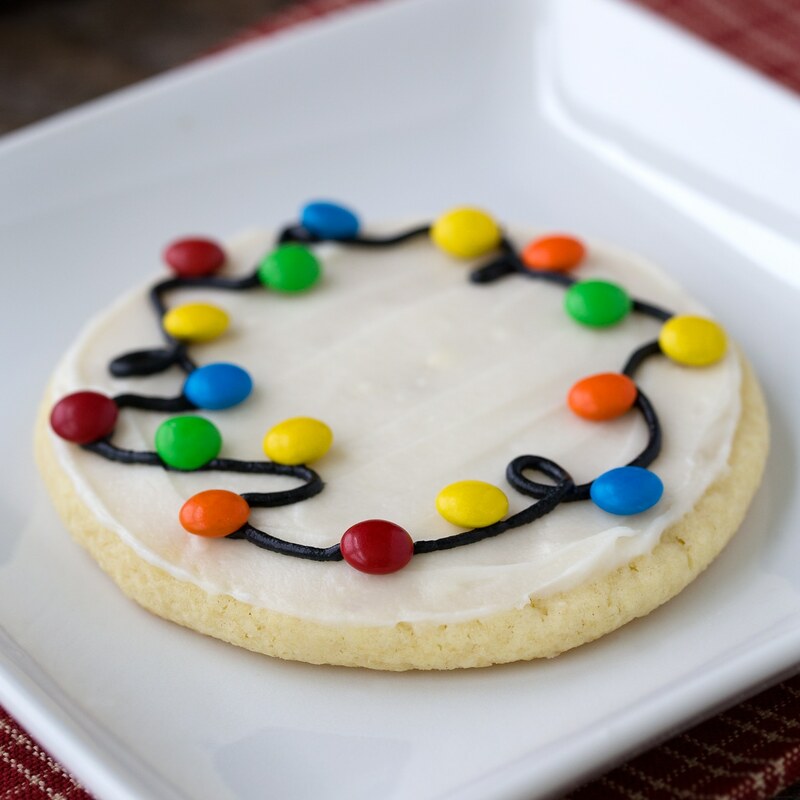 Our Christmas Lights Cookies are the perfect Christmas cookie recipe for the holidays. Guaranteed to please kids of all ages, they are an easy and fun cookie to make for Christmas parties, cookie exchanges, or relaxing afternoons at home. 1. Cream the butter, shortening, sugar, 2 tsp of vanilla extract, and 2 eggs in a large bowl. Mix in the flour, baking soda, baking powder, sour cream, and salt. The dough will feel soft and sticky, so chill the dough directly in the bowl until it’s firm. 2. Roll the dough onto a well-floured surface, then cut it into circles with a cookie cutter. Place the cutouts on a parchment lined pan and bake at 350° for 8–9 minutes. 3. While the cookies are cooling, prepare the frosting by mixing 1 stick of unsalted butter with 3 cups of powdered sugar, 1 tsp of vanilla extract, and 3 tbsp of milk. Divide the frosting into 2 small bowls. Stir black food coloring into 1 bowl and leave the second bowl uncolored. 4. Spoon the black frosting into a bag fitted with a #1 tip. 5. 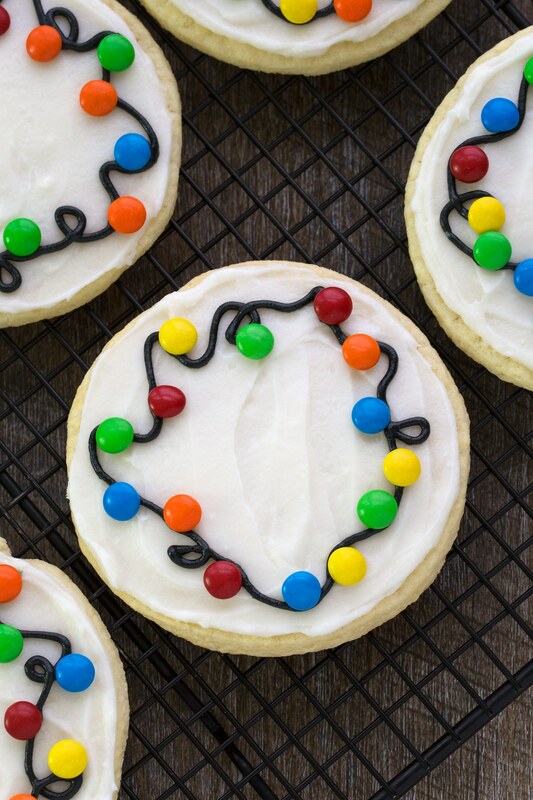 Use a round, flat knife to spread white frosting onto each cookie. 6. Then pipe the black frosting along the outside, creating loops and curves to emulate tangled holiday lights. 7. 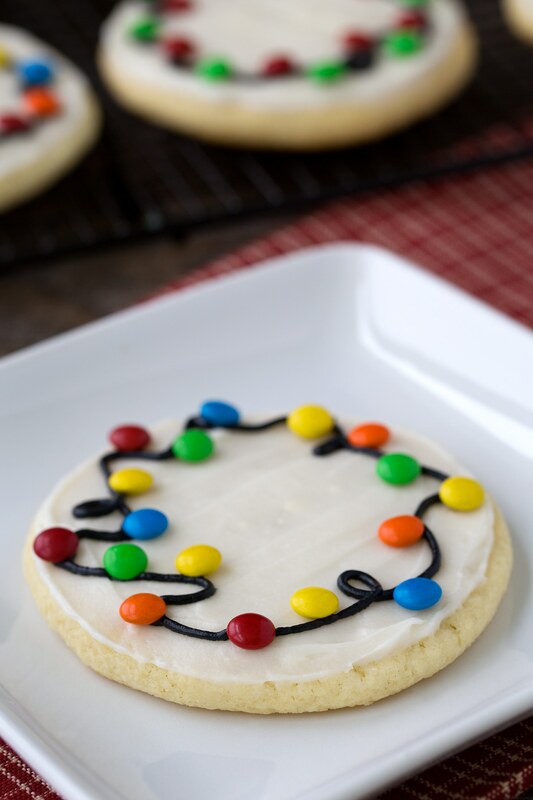 Last, invite kids to press mini M&Ms into the black frosting to create a complete strand of lights. 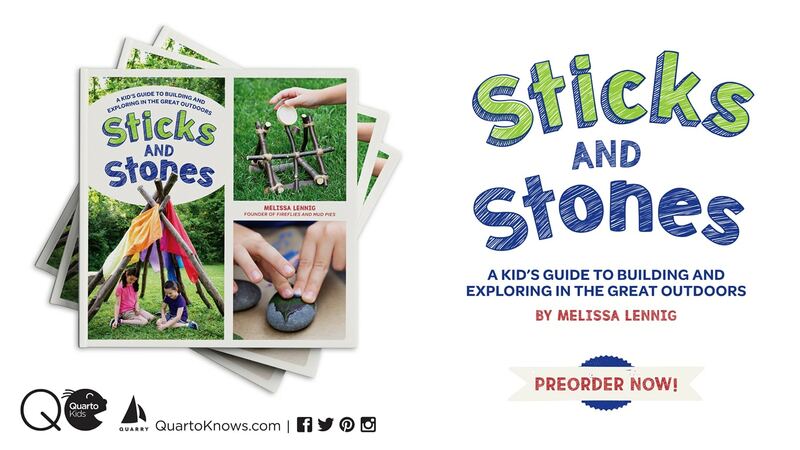 Tip: Dye-free kids? Try these dye-free chocolate coated candies. They are just as delicious as they look! 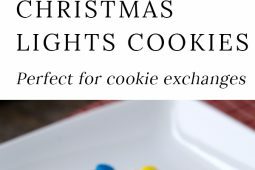 Guaranteed to please kids of all ages, Christmas Lights Cookies are an easy and fun Christmas cookie to make for holiday gatherings. Perfect for cookie exchanges! Cream the butter, shortening, sugar, 2 tsp vanilla extract, and 2 eggs in a large bowl. Mix in the flour, baking soda, baking powder, sour cream, and salt. The dough will feel soft and sticky, so chill the dough directly in the bowl until firm. 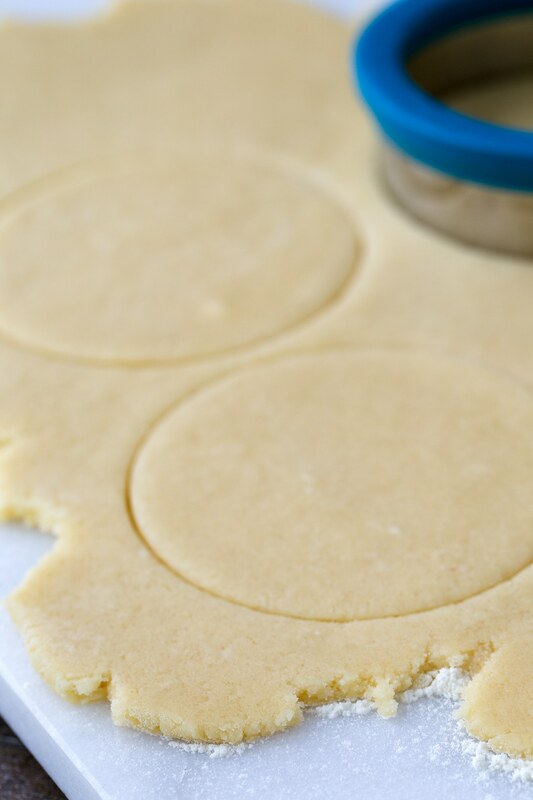 Roll the dough onto a well-floured surface, then cut into circles with a cookie cutter. Place the cutouts on a parchment lined pan and bake at 350° for 8–9 minutes. While the cookies are cooling, prepare the frosting by mixing 1 stick of unsalted butter with 3 cups of powdered sugar, 1 tsp of vanilla extract, and 3 tbsp of milk. Divide the frosting into 2 small bowls. Stir black food coloring into 1 bowl and leave the second bowl uncolored. Spoon the black frosting into a bag fitted with a #1 tip. 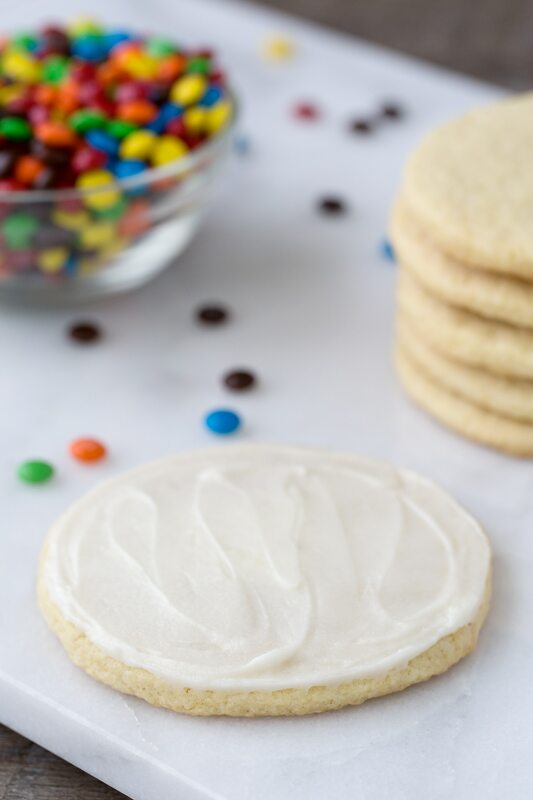 Use a round, flat knife to spread white frosting onto each cookie. Pipe the black frosting along the outside, creating loops and curves to emulate tangled holiday lights. 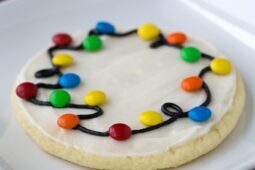 Last, invite kids to press mini M&Ms into the black frosting to create a complete strand of lights. Thanks for sharing! I’m planning to make these today for a cookie exchange at work. Do they need to stay refrigerated? Also can you freeze with icing or should I just freeze baked cookie and then frost when I need them? Thx!